by Robert A. J. Gagnon, PhD. 1. Statistics about the Unfinished Task of World Evangelism. ▪There are approximately 7.5 billion people on Earth. Approximately 750 million (or about 11 percent) of those are willing to claim Jesus as personal Lord and Savior. ▪Of the 16,700 distinct people groups on the planet, 6734 people groups (roughly 60 percent) contain between zero and two percent evangelical Christians. Many of these 6734 people groups have no churches, no Bibles, no Christian literature, and no mission agencies who are seeking to share the gospel with them. ▪If the church and evangelical missions worldwide were able to send one missionary to each group of 5000 people (of the 3.5 billion) we would need 700,000 additional missionaries! 2. Diaspora, “a people scattered.” The Global Diaspora Network (GDN networks and encourages ministries to diaspora worldwide. For example, there are over one million Filipinos in Saudi Arabia; 50,000 of these are evangelicals encouraged to reach out with the gospel to Saudis! 3. Children Everywhere! Please pray for many additional missionaries to serve with the gospel and compassionate care to the 100 million street children, 160 million orphans, and other children in crisis in Africa, Asia, Europe, and Latin America. 4. Additional Missionaries Needed for Manila. Metro Manila is composed of about 17 municipalities (called “cities”) with a total population of 20 to 25 million people! Perhaps you would pray for a great influx of missionaries (ages 21 to 81) to serve in each of these 17 cities by working with local evangelical churches in ministries of encouragement, evangelism, discipleship and development to the glory of God. Missionaries are needed to help mentor pastors in ministry, and all ages are needed to work with street children, the rich, the poor, prisoners, businessmen and women, political leaders and in all aspects of ministry of the gospel. … Christ in you, the hope of glory. We proclaim Him, admonishing every man and teaching every man with all wisdom, so that we may present every man complete in Christ, (Colossians 1:27-28). Have you ever been surprised or disheartened with the conduct or teaching of big shots, celebrities, pastors of mega churches or directors of large ministries? Are you discouraged by their rudeness, crudeness, anger, language, teaching, or lavish and ostentatious life style? Most of us are intimidated and fearful to say anything. After all we may only be a pastor of a small church of 50, so who are we to confront (even graciously) a pastor of a church of 5000? How can we speak to the conduct of a famous Christian author when we’ve never written a book? But should not all of us in the body of Christ encourage each in the body in our conduct and walk with God? I spoke at a meeting of pastors and was seated next to a well-known pastor of a large church who was known for his crudeness in the pulpit. He spoke to no one at the table even when spoken to. When I sought to encourage and talk to him, he simply looked at me with an angry stare. Was this a time to say something like, “Hey, brother, what do you think of Paul’s instruction to the church in Colossians chapter 3, when he says that as a Christian, we are to put on (so the world can see) a heart of compassion, kindness, and humility? Brother, as a pastor and teacher of the Word, is it possible to be a true believer without the evidence in our lives of things that clothe a follower of Christ?" Well, we do know (or should know) who we are; we are members of each other in Christ, in His body the Church! So, as those who have been chosen of God, holy and beloved, put on a heart of compassion, kindness, humility, gentleness and patience; bearing with one another, and forgiving each other, whoever has a complaint against anyone; just as the Lord forgave you, so also should you. Beyond all these things put on love, which is the perfect bond of unity, (Colossians 3:12-14). Let no unwholesome word proceed from your mouth, but only such a word as is good for edification according to the need of the moment, so that it will give grace to those who hear, (Ephesians 4:29). Let all bitterness and wrath and anger and clamor and slander be put away from you, along with all malice. Be kind to one another, tenderhearted, forgiving each other, just as God in Christ also has forgiven you, (Ephesians 4:31-32). Therefore if anyone is in Christ, he is a new creature; the old things passed away; behold, new things have come, (2 Corinthians 5:17). For the love of Christ controls us, having concluded this, that one died for all, therefore all died; and He died for all, so that they who live might no longer live for themselves, but for Him who died and rose again on their behalf, (2 Corinthians 5:14-15). If our teaching, life style, and conduct do not glorify the Lord Jesus, what good is it having a large ministry or church? If 40,000 spotted owls were dying every day, there would be an outrage. But 40,000 children are dying, and it’s hardly noticed, said one representative to the UN Convention of the Rights of the Child. One hundred million extremely underprivileged and street children struggle for existence in today’s cities. One hundred million! Are these children trash? Local businessmen in Brazil call them...Vermin, Garbage. If we let them grow up, they will be criminals, a blight on our society. Therefore, some policemen (and others)moonlight by contracting to kill many of them. In 1992 an average of 400 of these children were killed monthly in Brazil. Some of these children are young and cute. They can still smile. But most are older, have rotten teeth, and are scar-faced, disease-ridden, flea- and lice-infested, shifty-eyed, suspicious, and fearful. They are the poor, the outcast, the abandoned, the exploited—the children of the streets. How do they exist on the streets? By begging, stealing, selling their bodies and eating out of garbage cans. 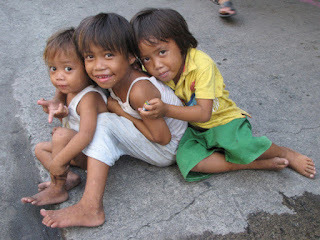 The government of the Philippines estimates there are up to 100,000 children living on the streets of Manila. Fifteen thousand of these are child prostitutes between the ages of 9 and 12. In Thailand there are 800,000 prostitutes from 12 to 16 years of age. In Sao Paulo, Brazil, another 800,000 children are living on the streets. Bogota, Colombia, has 8,000 to 10,000. Estimates in Mexico City are over one million underprivileged children, with 240,000 living on the streets. Ramon drooled over a vivid description of a sumptuous dinner. Ten-year-old Leila pleaded for the chance to go to school. She longed to read and write. Ricardo looked up from his shoe-shine box to whisper wearily that what he always wanted in his 12 years is a father. Maria’s aggressive retort was, To be left alone! from abuse and violence, and Nelson said that more than anything, he wants to play. The biggest wish? Not new cars, fancy houses, property, exotic vacations, the desire to be prosperous and famous? No, the biggest wishes of street children are for things many take for granted: home, good food, family, school, the chance to play and work, the freedom from fear and violence. Really, they’re not asking much, are they? Why is working with children, the smaller half of the world so important? First, God said of the Ten Commandments, “Impress them on your children” (Deut. 6:7); therefore, working with children is central to obedience to God. Second, it is important because of the bulk of the world’s population is children. Third, children play important roles in society, positively as well as negatively. There are an estimated 40 million children on the streets of Latin America. The majority of them are becoming a plague to society; but by helping these children we can help society as a whole. What can you do? You as an individual can have a large impact on one, two, or more street children throughout the world. For example, if you set aside just 25 cents per day to assist street children, this would total $30 in four months, which is all it costs to send a child to camp for one week in Brazil, Mexico, the Philippines or Africa. How can you help the 100 million children of the world? Christian Hedonism, Is It Right? ‘Christian Hedonism’ is a term adopted in the literature of Dr. John Piper to describe his scheme for sanctification and advance in the spiritual life. Certainly, it is a very strange term, because hedonism is, for Christians, a bad word. Hedonism means the pursuit of pleasure as the chief good, but in the case of this new scheme of spiritual living, it refers to the pursuit of pleasure in God. Christian Hedonism says that the pursuit of happiness in God is the overruling source of power and energy for the life of the Christian. The proposer, Dr. John Piper, is a prominent evangelical preacher in the United States, who began to popularise his views in 1986 with the publication of his book, Desiring God. In this he maintains that delighting in God is the pivotal issue in the Christian walk; the central and the most important part of the life of faith. Dr. Piper makes much use of the little sentence, ‘God is most glorified in us when we are most satisfied in Him.’ Indeed, the pursuit of joy in God is held as being one and the same thing as glorifying God. Why should this article set out to assess this teaching? The answer is that many pastors and people are being influenced by it, but very serious cautions need to be sounded. It is not surprising that believers find Christian Hedonism or ‘delighting in God’ interesting and attractive. To delight in the Lord is a magnificent and biblical exercise. But Dr. Piper’s formula for its use undoubtedly alters the understanding of sanctification long held by believers in the Reformation tradition, because it elevates one Christian duty above all others. Delighting in God, we repeat, is made the organising principle for every other spiritual experience and duty. It becomes the key formula for all spiritual vigour and development. Every other Christian duty is thought to depend on how well we obey this central duty of delighting in the Lord. The entire Christian life is simplified to rest upon a single quest, which is bound to distort one’s perception of the Christian life and how it must be lived. Whatever the strengths of Dr. Piper’s ministry, and there are many, his attempt to oversimplify biblical sanctification is doomed to failure because the biblical method for sanctification and spiritual advance consists of a number of strands or pathways of action, and all must receive individual attention. As soon as you substitute a single ‘big idea’ or organising principle, and bundle all the strands into one, you alter God’s design and method. Vital aspects of Truth and conduct will go by the board to receive little or no attention. This is certainly the case with Dr. Piper’s method, as we will show. The same goes for all the attempts at constructing a single-principle formula for sanctification that have been devised over the years. One thinks of the branches of the holiness movement, each of which has invented a single overriding principle, whereby one particular spiritual duty has been made superior to all others, these being made dependent upon it. You cannot reorganise the Lord’s way of accomplishing the fruits of godliness without many duties being swept out of view. ‘Single-principle’ systems do not intend to cause harm, but, inevitably, they do. To borrow a piece of modern scientific jargon, biblical sanctification is a system of irreducible complexity. Not that it is too complicated - having only seven or eight well-known component virtues which must all be kept to the fore in ministry. It may be helpful to refer here to the founder of this new ‘delighting in God’ method of Christian living. Dr. Piper, now in his mid-fifties, has for the last twenty or so years been the senior pastor of a very large church in Minneapolis. Prior to this, he was an academic, a seminary professor. Without doubt he is a Calvinist, and much of his written output is entirely admirable (although his presentation of the work of Christ and justification has been challenged). Dr. Piper is particularly noted for passionate communication. Those who know him say that his entire heart is in what he teaches. He is clearly no mere ‘performer’. He writes and preaches with a distinctive and compelling style, achieving a popular ‘flow’ which everyone can follow, and yet without sacrificing depth of reasoning. He also produces many extremely powerful, expressive sentences (although these often mingle with others rather overloaded with superlatives). This reviewer must own that he finds Dr. Piper too keen on producing startlingly original ways of looking at everything, and seldom are these to be found in the Bible. He is a master of the oblique approach, but at times his rather contrived reasoning leaves one grateful that Scripture, by contrast, is so straightforward and free from philosophical gymnastics. Dr. Piper’s main proposition - that we must delight in the Lord - commends itself to us all. It touches every conscience. It is scriptural. It is necessary. It is neglected. Accordingly this scheme for Christian living will naturally seize our attention and challenge us. The great problem arises from it being made the supreme issue of life, and the core of our obedience to God. Is the key aim to delight in God? Is the root of all righteousness to delight in God? Is delight in God the only true and worthy motivation for good deeds? In Dr. Piper’s scheme, every other Christian virtue, from love to temperance, is dependent on this. We cannot have either motivation or energy for the life of faith unless our prime aim is to be delighting in God. This, in a nutshell, is the method which is proposed. Dr. Piper tells us that while browsing in a bookshop as a young man, he found Weight of Glory, read the passage on the pursuit of joy, and was overwhelmed by a whole new view of the Christian life. From that moment he began to develop the determined and passionate pursuit of pleasure in God as the supreme and all-controlling principle of life. Dr. Piper often quotes Jonathan Edwards, who said much about delighting in God and Christian joy. By reference to Jonathan Edwards, Dr. Piper effectively says, ‘Look, this is as old as the hills. This is the way our forebears thought.’ Certainly Jonathan Edwards provides choice passages about delighting in God, as did the English Puritan writers, but at no time does he frame a system in which this becomes the key principle of Christian living. Joy in God always sits alongside other equal duties. Although Dr. Piper seeks to root his system in the past, he seems at the same time well aware that it is a brand new idea. Frequently, he virtually admits it by using the language of innovation, and saying, in so many words, ‘This is explosive’; ‘This is stunning’; ‘This is radical’; ‘This is dangerous’; ‘This is not safe’; ‘This is surprising’. Dr. Piper really knows that he is promoting something novel. He even uses the term, ‘my vision’, and that is what it is, for however well intended, it is Dr. Piper’s personal vision. He also calls it ‘my theology’. Dr. Piper’s publisher calls his book a ‘paradigm-shattering work’, and bids the reader join Dr. Piper ‘as he stuns you again and again with life impacting truths you saw in the Bible, but never dared to believe.’ The reality is that no one ever saw them like this in the Bible until Dr. Piper pointed them out in the 1980s. A special matter for concern is Dr. Piper’s use of Scripture, because his books appear to establish every point with a host of relevant quotations. He takes the reader through every step with biblical validation. This obviously commends his viewpoint to readers, but the Scriptures quoted never actually support the thesis Dr. Piper presents. I do not for a moment suggest that his use of Scripture is devious or manipulative, but he is clearly so carried along by his ‘vision’ that he sees corroboration where it is not to be seen. Here are some examples of this. This is quoted in support of the idea that the pursuit of enjoyment of God is the key motivating action for all other Christian virtues. However, the text does not actually say this. It is obvious that the force of the charge is that the Israelites had forgotten their privileges, and refused willing obedience to God. The verses do not go further and charge them with failure to pursue delight and pleasure in God as their prime objective. Dr. Piper’s thesis injects itself into the text, rather than receiving support from it. We may glance also at Psalm 16 as a typical example of Dr. Piper’s use of quotations. ‘Thou wilt shew me the path of life: in thy presence is fulness of joy; at thy right hand there are pleasures for evermore’ (Psalm 16.11). A look at the context shows that David is speaking about eternity, about Heaven. Although there is wonderful joy even while on earth, this is mingled with trials. The psalm does not say anything to support the idea that delighting is the key to spiritual living. To the relaxed reader such texts may appear to be supportive, but in reality they are not. There are at least eight distinct exhortations in this grouping of verses, and delighting is by no means the first. Clearly, what the psalmist has in mind is a set of distinguishable and relatively equal duties. He does not single out one saying, ‘If you get this right, the others will follow.’ David is inspired to provide a multiple-track method of sanctification in which attention must be given to a number of duties at the same time. This is exactly what traditional evangelicalism presents. David describes the multi-track teaching taken up by the Reformers, the English Puritans, and the great Continental dogmaticians. Thus, a psalm to which Dr. Piper appeals in order to justify his central organising principle, actually teaches the opposite, upholding a multi-track approach to sanctification. It is therefore necessary to say - take great care with the Scriptures advanced by Dr. Piper. They are obviously quoted in all sincerity, with passion and conviction, but they never truly support his very singular scheme. Baxter nowhere suggests that any single element of the spiritual life can be singled out and made the basis of success in all the others. Puritan divines characteristically took hold of each duty and virtue, defining it, listing the impediments to its accomplishment, and identifying the encouragements and helps. Each one received individual and careful attention. Matthew Henry is also quoted in support of Dr. Piper’s scheme, but not realistically, because he also gives equally close attention to each Christian virtue, each problem, each sin tendency. In a work as large as Matthew Henry’s wonderful commentary it is not hard to find quotations which may seem to support the ‘joy-is-everything’ idea, but it is certainly not the great commentator’s position. All Christian duties overlap a little and help each other, and quotations to this effect are numerous. As we have noted, the Puritans are multiple-track if they are nothing else. They focus on mortifying sin, enduring, obeying and praying (with agonising). They press upon us the duty of self-examination, including even self-humiliation. Then they extol the duties of praise, thanksgiving, reflection, yes and joy in the Lord. However, it is multi-track. All duties are as important as each other. If it is possible to see one duty lifted a little higher than the others in Puritan literature it is probably obedience, not the pursuit of joy, but this is no doubt endlessly debatable. We remember also that the Puritans had a place for the child of light walking in darkness (Isaiah 50.10). They paid a great deal of attention to the problem-times of spiritual gloom. The great confessions, the Westminster and the Baptist confessions, ascribe two reasons for spiritual darkness, when the clouds roll across the heavens. Reason One is the possibility of sin. Reason Two is the possibility that God brings about this darkness Himself, in His grace, to bring out our faith and trust, and so cause us to deepen and advance. Besides these, the old writers also see the believer living out life as an alien in a hostile world, oppressed by the sin and unbelief around, and yearning for home. These trials and tribulations must be borne. They cannot simply be anaesthetised away. They are part of the faith-building process. Disappointment and sorrow and grief are essential for self-examination by both individuals and churches, and also as the fuel of compassion to lost souls. There is no adequate and balanced view of trials and heartaches in Dr. Piper’s system. In fact, as far as I can see, the only way he addresses spiritual heaviness is to urge repentance for coldness of heart. This is the kind of shallowness even a brilliant man will stumble into once he subsumes the whole range of biblical principles and virtues under one. We may think again of Richard Baxter, noting how he once preached a great sermon entitled “The Causes and Cure of Melancholy for the Cripplegate Morning Exercises” at St Giles, in the City of London. How long that sermon lasted is anyone’s guess. This writer has estimated two hours. A friend insisted four hours. Whatever the length, Richard Baxter could never have assembled such a mass of priceless observations and counsels if he had been strait-jacketed within the ‘pursuit of joy in God’ system. He was, however, free to concentrate on depression and all its aggravating causes, then provide help, without the distraction of an artificial formula for the spiritual life. Or take Dr. Piper’s quoting of Jonathan Edwards, when he wrote - ‘God is glorified not only by His glory being seen, but by its being rejoiced in. When those that see it, delight in it, God is more glorified than if they only see it.’ Is Jonathan Edwards saying that delight in God is the channel and organising principle for all Christian activity and progress? No, for we take account of the environment in which he ministered. His language was always influenced by the sickness of the society in which he lived. It was a church-going age. Practically everyone was theoretically a biblically enlightened, well-instructed Christian. Yet he was anxious to distinguish between those who had real spiritual life, and those who did not. His language here cuts between those two groups. It reflects the burden of his message: that you can be a merely theoretical Christian, or you can be a spiritually alive Christian. The former will only see, whereas the latter will be filled with passion. Equally, his words challenge a cold or backslidden believer to resume a fervent walk with the Lord. There is no implied endorsement of Dr. Piper’s unique system of sanctification. At times Dr. Piper reflects a fear that his teaching could lead to a mystical serenity. His fear is well grounded, and this writer is sure that it does lead to this. He frequently uses the language of direct mystical communion. Although the joy pursued is derived from reflecting on the Lord, the end is still subjective, and this will lead to a self-conscious nurturing of happiness. This will become for many an unhealthy preoccupation, emotions being artificially ‘cranked up’ (a feature of other single-dominant-issue movements). Dr. Piper also employs New Testament passages to support his thinking, but not appropriately. Take Acts 20.35 where Paul quotes the words of Christ, saying ‘I have shewed you all things, how that so labouring ye ought to support the weak, and to remember the words of the Lord Jesus, how he said, It is more blessed to give than to receive.’ Dr. Piper expounds this to mean that the delight and pleasure which we procure from reflecting on the Lord, is the essential motivation and energy for all good deeds. Christ is shown to be the authority for this. However, Paul does not teach that we must fuel our generosity from the happiness derived from contemplation of the Lord and His blessings to us. This activity is precious, but it is not the vital driving force of our giving. Neither Christ nor Paul teach this - they simply state facts. If we give until it hurts, then we may derive comfort from the fact that it is more blessed to give than to receive. It is not a lesson in how we may motivate and energise ourselves for giving, as if our performance of compassionate deeds depended on our basking in the delights that are ours in Christ. It may have been during the course of the Sermon on the Mount that Christ gave His words. If not, He certainly gave similar teaching there. In each of the Beatitudes, the Lord speaks of the outcome or reward for a trial borne or a duty performed. He does not set out to tell us how to motivate ourselves for the duty, but how we may be comforted and encouraged by the ultimate blessing. Our motive will be an inborn desire to obey Christ and please Him and live out His standards. We will also be motivated by compassion for others. These are our motives and longings. To fulfil duties only for reward is to diminish or cheapen Christian character, and to hinder any real personal advance. In other words, our appreciation of God is one matter, and our desire to obey Him is another. The two are linked, but one does not take care of the other. Dr. Piper, however, says that even Christ motivated Himself by thinking about the future reward. He quotes Hebrews 12.2 where it is said of Christ - ‘who for the joy that was set before him endured the cross’. Says Dr. Piper, in effect - this is wholesome, this is holy, this is righteous, this is what motivated Jesus Christ. He could go through with the cross, only because He could set it against the future joy. When the Lord went to Calvary it was an unselfish act. We repeat that in Hebrews 12.2 the word ‘joy’ represents the achievements of redemption. Christ’s strength came from His view of what would be accomplished. So great was His love and compassion, that the goal of millions of saved people moved Him to pay that unthinkable price. No, the love of God must be seen here in all its wonder, quite apart from the joy of God. Similarly the love which is put into the heart of the Christian at conversion is a pure and wonderful quality that cries out to be expressed. It may be suppressed and tarnished for periods by sin, and it certainly needs to be nurtured, but at the same time, it is a wonderful quality in itself. It is unselfish and un-self-seeking (as in 1 Corinthians 13). It is a tiny, minute, microscopic fragment of an attribute of Almighty God. It is not right to reduce it to a neutral thing, dependent on the stimulation of pleasure - however sacred that pleasure may be. It is a love that endures, even when the faculty of emotional feeling is burdened by grief, or jaded. Some degree of love is in everyone, even the unregenerate. Unconverted people can carry out some beautiful and entirely unselfish acts. Perhaps a small capability of love has been preserved in the heart of the ungodly, not because it is deserved, but to leave a language for the Gospel. People would be unable to understand the wonderful love of Christ, and His act on Calvary, if there was no recognition or concept of love left in the world. The love which comes with the new nature at conversion is a much more wonderful quality. It may certainly be energised and stimulated to some extent by reflecting on the fact that God will be pleased with this, but it ideally acts naturally, out of Christ-likeness and compassion, and then out of duty and obedience to God. Christian Hedonism really reduces love to cause and effect. It sounds so spiritual and God-centred, but it is an emasculated love. Dr. Piper reinforces his idea for strengthening love from Hebrews 10.34, where we read - ‘For ye had compassion of me in my bonds, and took joyfully the spoiling of your goods, knowing in yourselves that ye have in heaven a better and an enduring substance.’ Says Dr. Piper, the reason why the people of God could accept persecution, with loss of their goods, was that they had joy in God, and in the certainty of a future inheritance. But this idea is not the intention of the passage. The word ‘joyfully’ is obviously selected to show how willingly the Hebrews accepted persecution, the price of helping the Lord’s servant. It is not intended to show that they laughed and leapt for joy as they were punished. Nor is it an insight into their mental processes. Did they say to themselves, ‘Can I allow my home to be seized? Now let me do some spiritual calculations. Let me consider - what are my gains?’ On the contrary, the text tells us that the motivating factor was compassion for the servant of God in his bonds, so they identified with him, visited him, fed him, and all those other acts which brought fury upon their heads. Then, as they lost their goods and their homes, they fortified and comforted themselves with the thought of their heavenly wealth. The latter did not precede and give rise to their sacrificial behaviour. Their love of the Truth and compassion for an apostle gave rise to their behaviour. Dr. Piper’s system of delighting in God goes too far in ascribing every spiritual act and desire to one factor, and depriving each virtue of its own value and power. One of the great problems with this ‘delighting in God’ scheme of spiritual advance is that it unwittingly puts self-interest right at the heart of the Christian life. Dr. Piper clearly would not intend this, but it is inevitable. Pursuit of joy in God has always been embraced as a Christian duty, but it must never be elevated above others so as to detract from their inherent virtue, nor must it eclipse the negatives of the Christian life - the ‘thou shalt nots’. We obey God because it is our duty, and, of course, because we love Him. We obey Him because He hates sin, and because it destroys and harms those around us. We obey Him because He is the One Who knows all things, and is infinitely wise. We serve Him and seek the spiritual good of others out of indebtedness and out of compassion. We must be multi-track in our pursuit of godliness, and not simplify the method of the Word. Andrew Murray, who died in 1917, a powerful writer, and a man of immense compassion and evangelistic fervour, inspired thousands through his books to adopt a single-issue system of sanctification. But for all its lofty goals and many truths, it tampered with the full-orbed biblical method, and could never work well. In the event it also provided the snare of spiritual pride. Thinking of a more recent single-issue writer, there is the case of a Christian psychologist, a sincere man, whose books are extremely popular today. He reduces the process of sanctification to the simple formula of ‘blocked goals’. In some ways this runs fairly close to Dr. Piper’s vision, but like all single-dominant-issue systems it cannot work. There are numerous such systems. In all cases, certain sins go untouched; certain problems never come under the spotlight. What does the ‘delighting in God’ scheme have to say about some of the rampant ills of the present-day Christian scene? What does it say about the charismatic movement, and the abandonment of reverence through contemporary Christian music? What does it say about irreverent Bible translations, and other appalling trends? The answer is that Dr. Piper goes in exactly the wrong direction on such matters. Why is this? Is there some intrinsic weakness in his scheme, causing him to show such poor discernment and concern? This writer believes that there is. All single-dominant-issue schemes tend to be blind to individual matters of deep concern. Their major preoccupation creates a kind of tunnel vision, and perception fails. Dr. Piper concentrates on seeing his delighting system in all the Bible, so that his recognition of the rules and principles which bear on other issues is seriously impaired. In fact, Dr. Piper’s system runs so near to the mystical-emotional basis of charismatic experience that it is not surprising to find him endorsing it in large measure, and claiming great blessing from his own experience with the Toronto Blessing. We understand he advocates charismatics and non-charismatics in the same church, and encourages all the trappings of charismatic life. Hedonism is hardly protective of principle. When delight is everything, doctrine suffers a setback. When subjective emotions are unduly elevated, the proving and testing of all things becomes impossible. On charismatic matters, and on modern worship matters also, Dr. Piper is - to put it gently - an unsafe shepherd, and the fault lies not in his Bible, nor in his capacities, but in his system. As the better aspects of his ministry earn respect from his readers, so the poor guidance on potentially disastrous issues will mislead them. God’s Word does not provide a single organising principle to govern and drive all the component duties of the spiritual life. ‘Christian Hedonism’ is not drawn from the teaching of the Lord, nor of Paul. However, the Bible does provide a clear prescription for the Christian life, listing a number of spiritual and moral duties, all of which must be given direct and individual attention. We are given famous lists (such as the Beatitudes of the Sermon on the Mount, and the lists of 1 Timothy 6.11-12 and Galatians 5.22-23 - see footnote 3) and we must set our minds to accepting a multiple-track righteousness. We will pay a high price for any kind of clever system that reduces biblical duties to an artificial formula, however sound and inspiring many of its elements may seem to be. Dare we question the apostle when we read the list of 1 Timothy 6.11-12? Will we say, ‘But just a minute Paul, you have left out the organising principle. You have left out any wonderful simplifying factor. You have left off the formula which will make it all come together.’ Of course he has, because there is no such formula. It is multiple-track righteousness. Seeking happiness is certainly not our prime goal. This is the recipe for emotional self-indulgence, subjectivism, and self-centred mystical ‘communion’ with Christ. How is it that some notable teachers have endorsed Dr. Piper’s books? Presumably they have appreciated the many fine sentiments, and have automatically and graciously passed over the author’s exaggerated emphasis on his big idea. Reviewers cannot always be expected to put themselves in the shoes of students and younger believers who are at risk of basing their entire approach to life on such material. Doug Nichols and his wife Margaret have served in missions for nearly 50 years of which 20 years were in the Philippines. They presently reside in Lancaster, South Carolina, where Doug serves as Global Missions Advocate/Mobilizer assisting with Christian Growth Ministries in the Philippines, GROW International Ministries, advocate for needy children, and in leadership development. Doug travels speaking on behalf of the glory of God in missions. Margaret travels in ministry with Doug is involved in speaking, teaching and discipling.